Bottega Veneta Parco Palladiano V Eau de Parfum, 3.4 fl. oz. 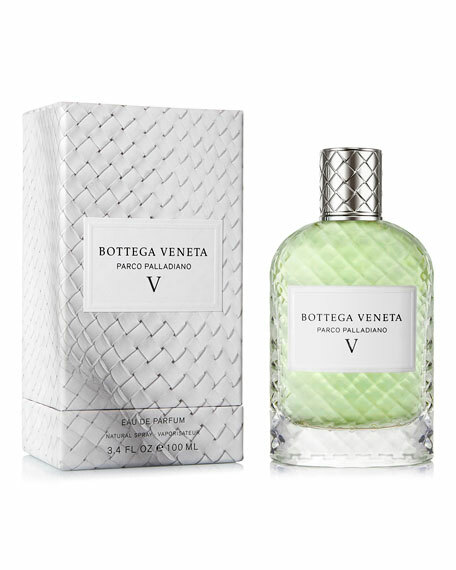 Bottega VenetaParco Palladiano V Eau de Parfum, 3.4 fl. oz. Your perfume should tell: "Timeless and lasting"
This is the idea for the six fragrances (numbers with simple roman numerals, I, II, III, IV, V, VI) that, like an "olfactory trompe l'oeil," combine the scents of indigenous plants and scents from these four main groups: flowers, wood, spices and fruits. The fragrances are crafted with ingredients historically found in the gardens. Inspired collaboration between artisans and designers is at the heart of Bottega Veneta's approach to luxury. Deeply connecting its identity to the Veneto region, as its territory of origin, Bottega Veneta Parco Palladiano flacon is a tribute to Venetian glasswork craftsmanship. Created with an extreme attention to detail, high precision and relentless perfectionism, the flacons and caps are entirely wrapped with intrecciato, reflecting the brand's exceptional heritage and superlative quality. Exclusively ours; also at the website and boutiques of the designer or vendor. For in-store inquiries, use sku #1841831.